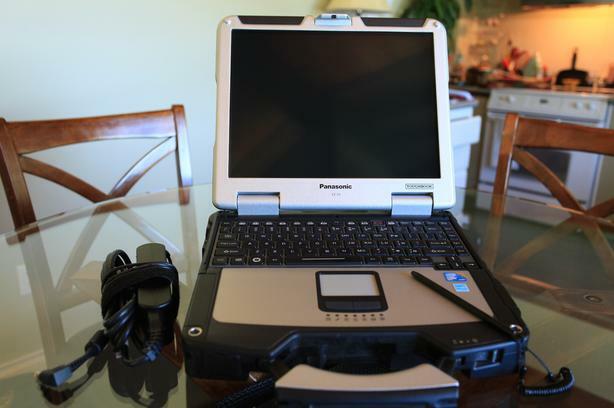 Panasonic Toughbook CF-31 3rd Gen i5. It's the notebook equivalent of a tank-with a force field around it. The Panasonic Toughbook CF-31 is able to withstand 70-mph winds and nearly 6 inches of blowing rain per hour. Or you can drop it from 6 feet 26 times. At ease with the most inhospitable of places without the constant fear of breakage or inoperability. Working in the elements is no problem for this tough machine, with its magnesium alloy case, is built according to IP65 certification for weatherproofing, and MIL-STD-810G certification for shock, vibration, and temperature extremes. It easily endures pressure of up to 300 pounds on a closed lid. The very best choice for Boating, Mobile Mechanic or Just Extreme Conditions. Military Grade, Panasonic Toughbook CF-31, 13.1"LED Laptop. Full magnesium alloy case with handle. Removable quick-release battery and storage drive. Reinforced locking port covers all in good working order.